In “Safety Last!” (1923), Harold Lloyd climbed to cinematic immortality. With each grueling step up the side of a towering office building, the traffic-clogged streets of Los Angeles clearly visible far, far below, he ratcheted up the tension to nearly unbearable levels. This greatest and most audacious of all action sequences still astonishes nearly a century later, generating the nervous laughter that became a Lloyd trademark and leaving even the savviest of viewers wondering how in the hell that lunatic didn't kill himself in the process. Never mind that Lloyd made the climb while missing a couple fingers on his right hand. Lloyd followed up in other films by clambering over rickety construction sites and other perilous locations, gleefully jangling everyone's nerves, but in “The Kid Brother” (1927), silent cinema's great daredevil proved his versatility by making a climb strictly for love. As the sweet and shy Harold Hickory (Lloyd, decked out as his signature Glasses character) bids farewell to the sweet and shy Mary Powers (Jobyna Ralston), he scrambles to the lowest branch of a tree so he can keep his darling in sight just a second longer. She waves goodbye again and crests a hill, so Harold climbs to the next branch, still savoring the sight of his dearest. And then the next branch and then... a hard tumble all the way down, where the smile on Harold's face as he sprawls in the dirt shows it was all worth it. It's one of the most endearing sequences in Lloyd's work, a heartstring-tugger that showcases the combination of heart and chutzpah that made Lloyd one of the most popular movie stars of any era. Harold Hickory isn't just eager to impress Mary. He's equally desperate to prove that he's as manly a man as his father (Walter James), the heroic sheriff of the town of Hickoryville (it's a family tradition) and his strapping brothers (Leo Willis and Olin Francis) who have little patience for their wallflower kid brother. Lloyd was a gifted athlete, notorious in the Hollywood scene for his ferocious tennis and handball play, and created the impression of being a Harold Milquetoast by casting the film with literal heavies, not just his brawny family members, but also the central villain, a grotesque bruiser played by German wrestler Constantine Romanoff, who is listed on IMDB at 6'2” but absolutely towers over the lithe 5'10” Lloyd. “The Kid Brother” mixes in as many gags per minute as any Lloyd picture, with some of the biggest laughs coming in an extended sequence where Harold's he-man father and brothers cower in terror for fear of being seen in their underwear by Mary. But the film only really ramps up the tension in the final act, when Harold boards an abandoned ship to retrieve some money stolen from his father. Once Harold boards the listing Black Ghost, he has to negotiate a landscape of wild diagonals, the 45-degree environment making the climactic battle all the more harrowing, and demanding all of the kid brother's ingenuity. This includes figuring out how to get a tiny monkey to wear heavy boots and clomp around the boat, but that's a complicated story. Watching almost any Lloyd film, you know that, no matter how long the odds may seem, he's going to save the day, and yet you're still going to cheer when the big moment arrives. Fifteen years and a few hundred films into his career, Lloyd had already perfected the blockbuster formula, one that would carry him well into the sound era. He and his team of gag writers and directors (the film is credited to Ted Wilde, though others directed, including the great Lewis Milestone) knew every button to push and every beat to hit. You know you're being played like a fiddle, and you don't mind one bit. The film is presented in its original 1.33:1 aspect ratio. From the Criterion booklet: “This new digital transfer was created in4 K resolution at the Packard Humanities Institute in Santa Clarita, CA, on a Scanity film scanner from Harold Lloyd Entertainment's 35 mm fine-graint struck from the original camera negative and preserved by the UCLA Film & Television Archive. The image was then restored by L'Immagine Ritrovata in Bolgona, Italy. Lloyd owned most of his films and stored them on his estate. Some were destroyed in a fire, but those that survived are generally in better shape than most silent films. Even knowing that, the quality of this 1080p is astonishing, with crisp image resolution and sharp B&W contrast throughout. Some modest signs of damage to this 90+ year-old print are evident at times, but far less than you would expect. Quite simply, this new high-def transfer looks great. Listeners can choose their musical accompaniment, with a 1989 orchestral score by composer Carl Davis as the default option, with an alternate choice of an archival organ score performed by the great Gaylord Carter, who passed away in 2000. Both enhance the experience greatly, and sound robust in an LPCM 2.0 mix. “The Kid Brother” clocks in at a crisp 82 minutes. Criterion has supplemented it with over two hours worth of supplementary features. 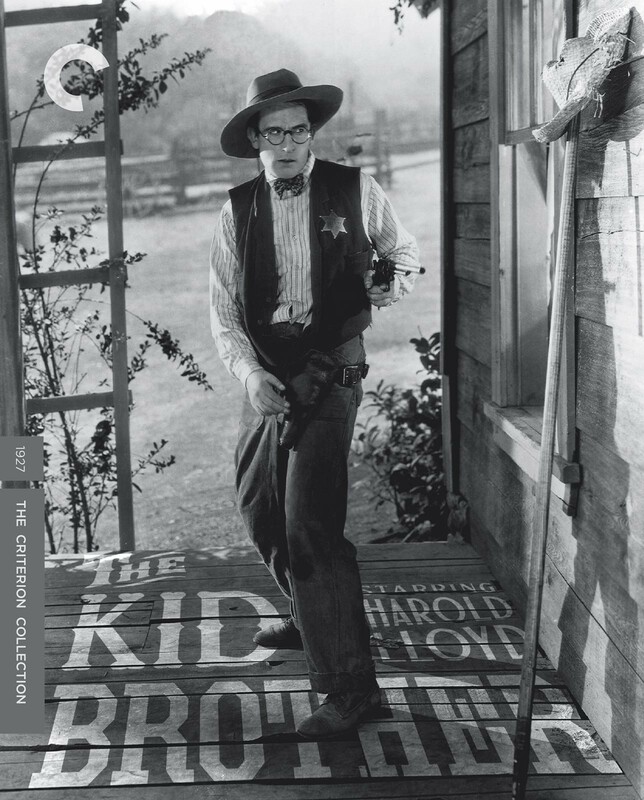 The film is accompanied by the commentary track from the 2005 New Line Home Entertainment DVD release, featuring film historian Annette D'Agostino Lloyd, Harold Lloyd archivist Richard Correll, and Harold Lloyd's granddaughter Suzanne Lloyd. In “Anatomy of a Gag: Monkeyshoes” (9 min. ), critic and filmmaker David Cairns touches on how Lloyd constructed some gags, with a focus on the film's frenetic final act. In “Close to Home” (16 min.) author and location historian John Bengtson talks about the locations used in the movie, providing some fascinating information, including the fact that the town of Hickoryville was built on part of the location that is now Forrest Lawn Cemetery. “Greenacres” (15 min.) is a 2005 piece also imported from the old New Line release in which Suzanne Lloyd takes viewers on a tour of what remains of Harold's vast Greenacres estate, one of the earliest sprawling movie star mansions built in Beverly Hills. It must have been quite a place to play as a kid. We also get an interview with Harold Lloyd (16 min.) which was originally broadcast on Dutch public television on Dec 14, 1962, on the occasion of the release of his popular compendium film, “Harold Lloyd's World of Comedy.” Lloyd talks about his career, his feelings about contemporary comedy, and directs a brief tour of Greenacres, which includes a shot of the famous gigantic Christmas tree Lloyd showed off every year. The disc also includes a collection of Behind-the-Scenes still photos from the movie's production. As wonderful as many of these pieces are, the real gems in this collection, and genuine treats for any Lloyd enthusiast, are two short films that were once believed to be lost (Lloyd owned all of his films, but many prints were destroyed in a fire on his estate.) “Over the Fence” (1917, 5 min.) is actually the first appearance of Lloyd's trademark Glasses character. Glasses tries to take his gal (Bebe Daniels) to a baseball game, but things go wrong in classic Glasses fashion. He eventually winds up pitching and then knocking out the umpire. I loved it. “That's Him!” (1918, 11 min.) shows Lloyd and Daniels as a poor newlywed couple who inherit money, but have challenges in claiming it. It's pure knockabout hijinx and plenty of fun. Both shorts are accompanied by new scores by organist Mark Herman. See the “Wurlitzer” feature below for more information. The two shorts are accompanied by the featurette “Preserving Harold” (11 min.) in which archivist Dino Everett of USC discusses the challenges of restoring these two films from unusual formats (9.5 mm and 28mm). I loved the riveting short documentary (20 min.) about a giant Wurlitzer organ used during the silent era that has been preserved and restored by composer Nathan Barr. Barr and organist Mark Herman provide a multi-room tour of this massive and unbelievably versatile behemoth that provided the live accompaniment to many silent films. What a machine! Herman performed the scores for the two short films mentioned above on this Wurlitzer. The slim fold-out booklet features an appreciative essay by critic Carrie Rickey. When asked for his favorite film, Lloyd often chose “The Kid Brother.” I wouldn't quite agree with him, as I think this is a step below his best-known films such as “Safety Last!”, “The Freshman” (1925), and “Speedy” (1928). 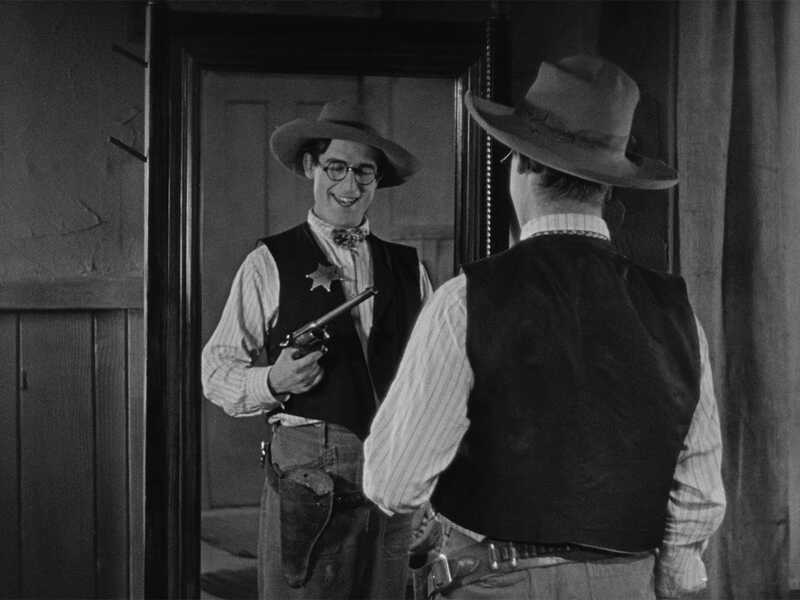 But it's still a gem that was a big hit in its day (like virtually every Lloyd film was, even his first few sound features) and reminds of just how versatile his Glasses character could be.